A great set for the flats but a tad heavy if you want to do a fair amount of climbing on them. I'm a firm believer that the dimpling pattern helps relieve the crosswind jitters. I bought my Zipp 404's in July 2016 and noticed that on the same 100 mile route my speed was 21.5 mph, compared to 21.0 mph when using Dura-Ace C24 wheels, so that's a 0.5 mph improvement. On the Seattle To Portland (STP) ride I managed 21,3 mph average for 205.5 miles on the Zipp 404 wheels. Favorite tire is the Continental Grand Prix 4000sII at 25mm. The rims are quite wide, so you have to let out your brake pads to fit them in. The Zipp supplied brake pads are nominal in stopping power, so consider upgrading to the Swiss Stop pads intended for carbon rims that will not void your Zipp warranty for an improvement in braking. 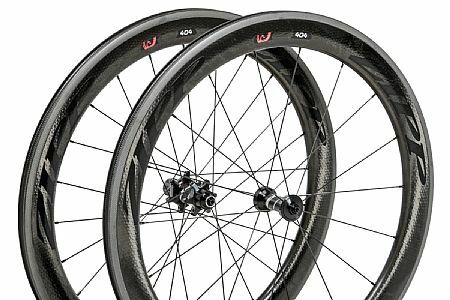 These rims make a lot of noise when rolling and especially braking, so you cannot sneak up on other riders because they will hear you coming in the distance. Wheels have stayed quite true almost one year later. I logged 16,000 miles in 2016, yet these rims still look new. I purchased these wheels for my TT bike replacing the stock wheels the bike came with. Transformed it from the first ride! I have around 500 miles on the wheel set so far and they seem great. Noticeable difference in wattsmph. I've had moderately deep rims (30mm), but these are the first wheels I've owned that are this deep. They're a little dicey in strong gusty crosswinds, but they feel surprisingly stable on fast descents. I think it's because they are so stiff. Braking is good in the dry with the recommended pads, but not quite as good as alloy rim brakes in the wet. But the coolest thing is how fast they are. Coasting down a descent with my riding buddies of similar weight, I end up at least 2-3 mph faster.